Foot Fall while traveling: Here you can see the foot position of the horse as he moves around you. In this circle to the left you can clearly see the left, or inside hind reaching forward and slightly under the horse, almost tracking behind the outside front. 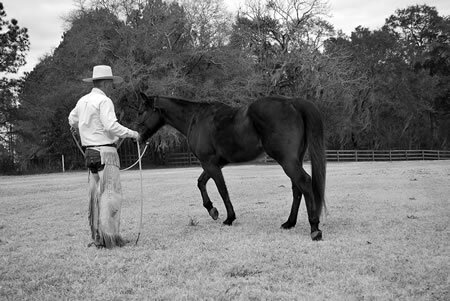 Groundwork is an essential tool in horsemanship. 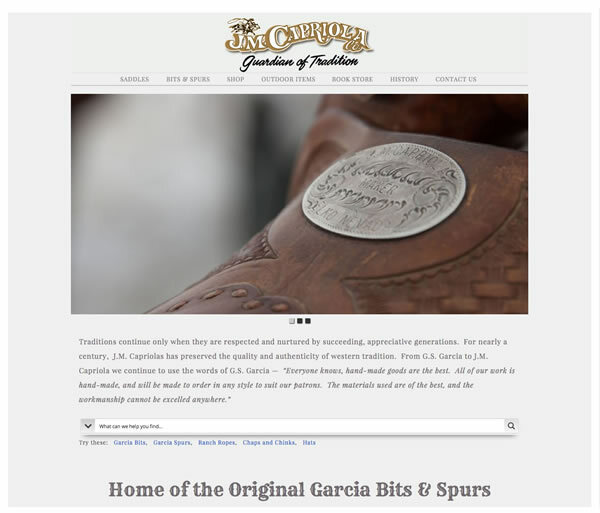 Its application begins with the first haltering of a foal as well as getting a colt ready to ride for the first time. 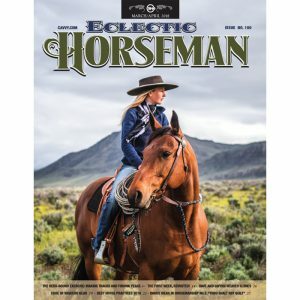 This article will cover just a few points on how your horse should look and feel when doing groundwork. 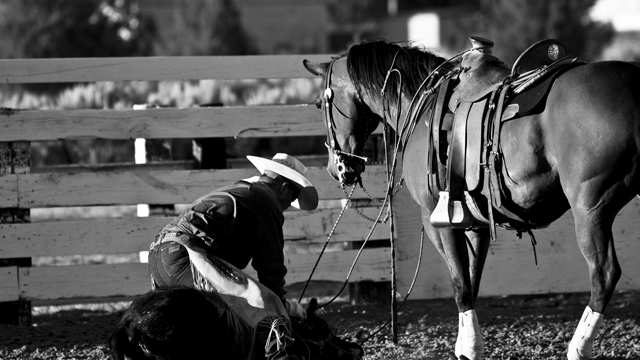 To many of us groundwork is used as a safety net to make sure our horse isn’t tight or bothered. 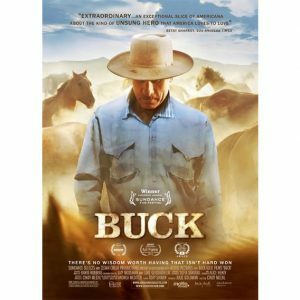 This is one benefit, but the advantages of proper groundwork go far beyond just “taking the edge off” our horses. 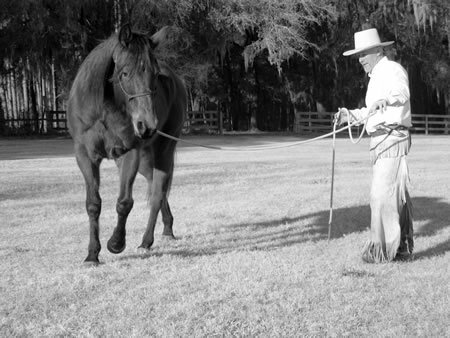 Whether you’re using a halter or snaffle bit, the lead rope is used just as a rein would be if you were in the saddle. 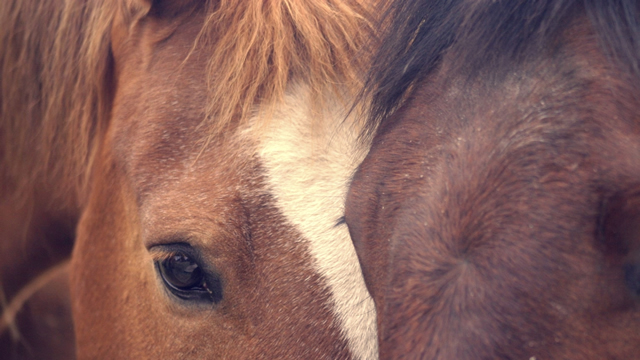 The horse should operate with softness, through a feel, not having to be pulled and pried around like a log. 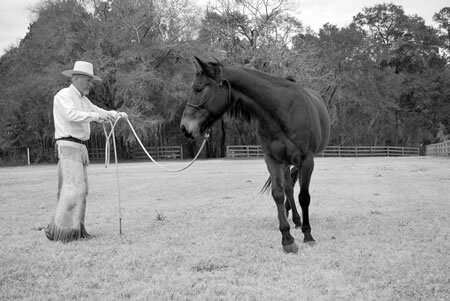 If our horse is operating through feel, the rein or lead rope will be connected directly to the feet. We should be able to direct any foot at the appropriate time, with little or no effort. Another consideration is the body. 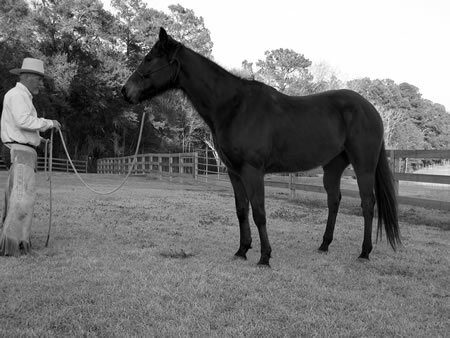 The body from nose to tail should have an arc, a roundness that fits the circle the horse is traveling in. 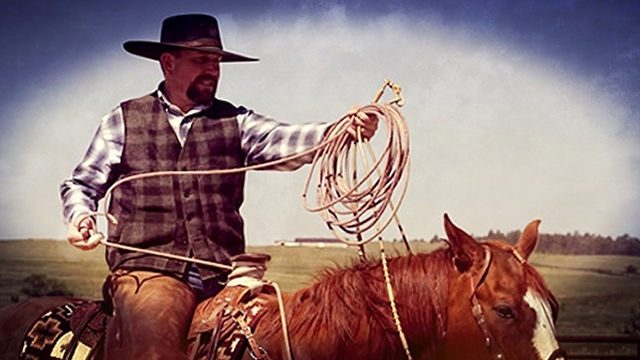 The inside jaw should be soft and the eye should be looking down the lead rope. With the horse facing you five or six feet away and the lead rope in the directing hand (we’ll use the right hand), raise your arm up and out. 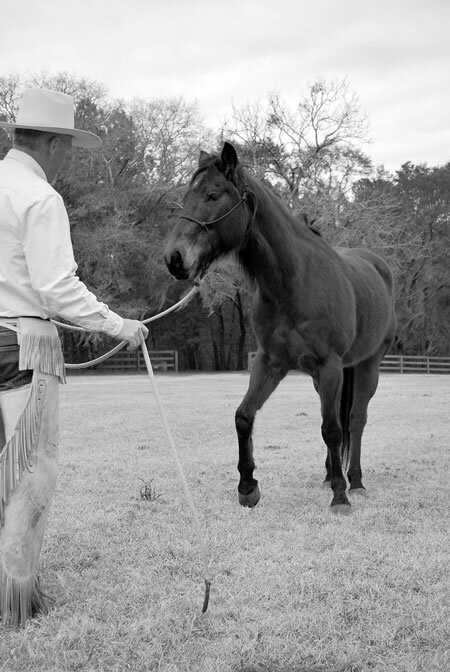 As the horse follows this feel or signal he will shift his weight onto his right front foot, tip his nose to his left and start out with the left front foot. As the horse begins to travel you will keep your arm raised. This is his signal to continue traveling forward and around you. 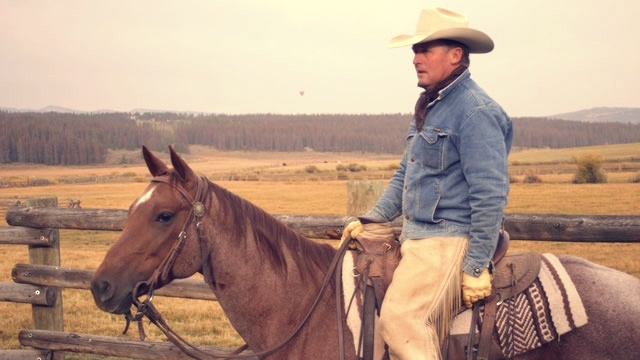 Keep turning your body so you are always facing the horse. 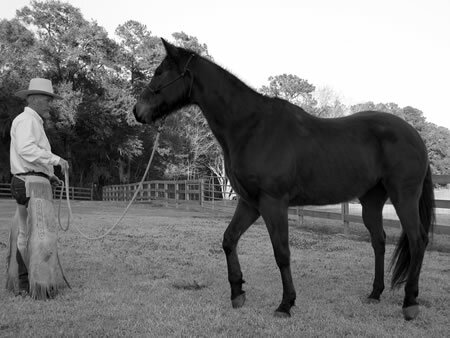 Move your feet as little as possible, but as much as necessary to keep your horse’s feet moving. By continuing to turn with the horse we are able to keep track of his foot fall and shape (body position). 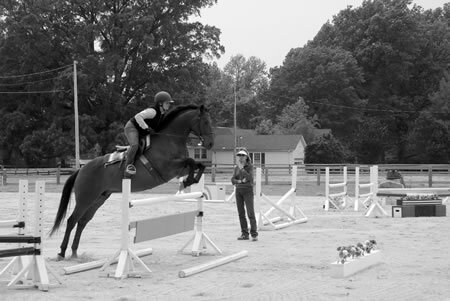 All four feet should be reaching forward equally. The inside hind foot (right hind) should be following the outside front (left). The horse’s body should have a slight bend to the right. 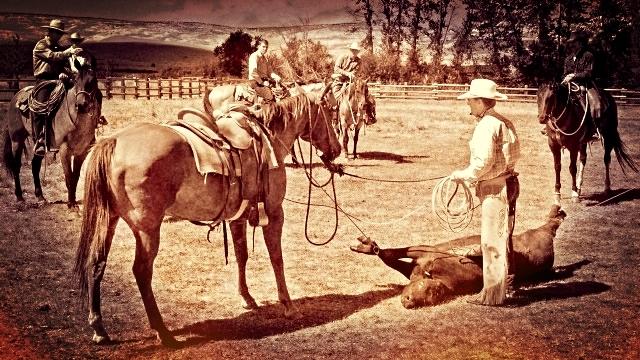 He should be operating on a slack lead rope, following a feel, and walking with life. 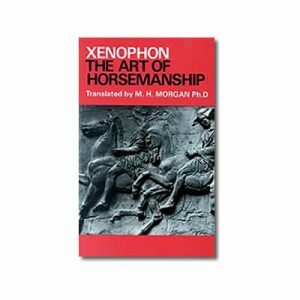 When the horse has gone around once or twice and is operating properly, ask the horse to roll the hindquarters away from you and stop facing you just as he was when you began. 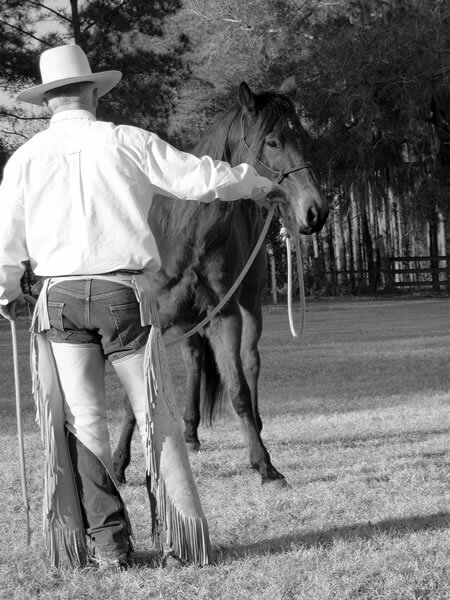 To roll the hindquarters, bring your directing hand from the extended position down to your waist. There is a timing factor involved in this transition. As the right or inside hind leaves the ground to come forward, this is the time to bring your directing hand down. 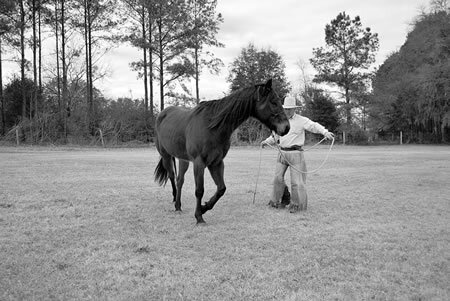 If the rein (lead) is hooked to the foot, the horse will set it forward of the outside hind and deeply under himself. 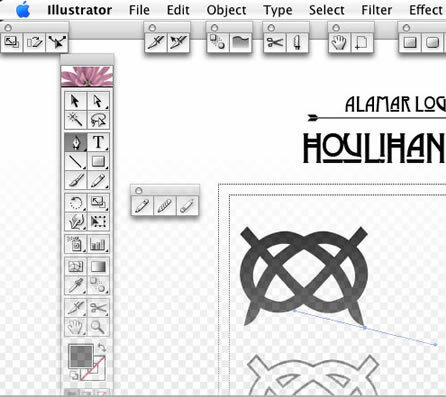 The inside hind will reach further outside the circle than the outside hind. The back legs would almost cross. After the inside hind reaches and sets down, the outside hind will pick up and reach past where the inside hind is. 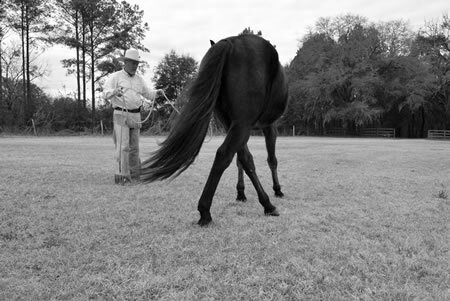 As the back feet are reaching deeper and further under the horse, the front feet will slow down and reach shorter. 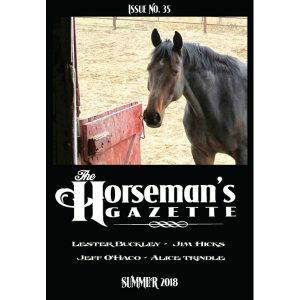 This will cause the hindquarters to out travel the front end, causing the horse to face you. Think of it like driving a wheel barrow. To turn a wheel barrow we slow the front end and increase the momentum behind. 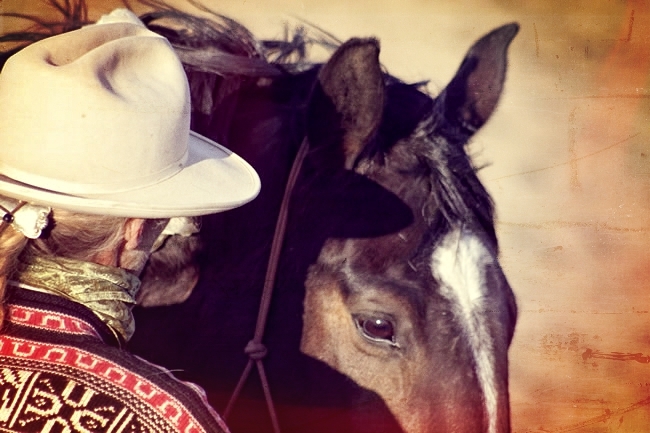 Be sure the horse doesn’t just turn and come to you. 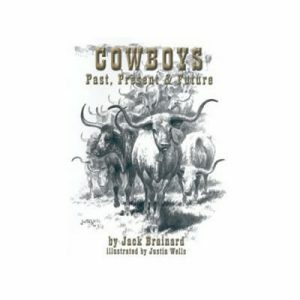 When he rolls the hindquarters over and stops, the front feet should be on or close to the line he was walking before he rolled his hindquarters over. 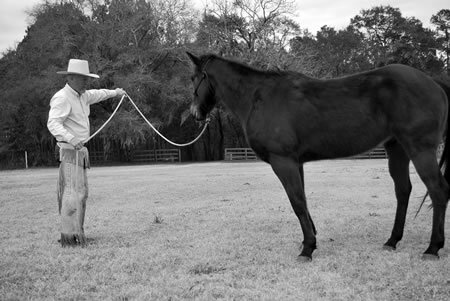 If you wanted to continue moving your horse in the other direction, you would change hands with the lead rope as you begin the original transition or rollover. 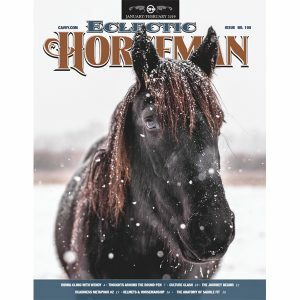 Once your horse has reached deep with his inside hind and set his outside hind out and back slightly, direct the front end back to the left with your left hand which is now your directing hand. 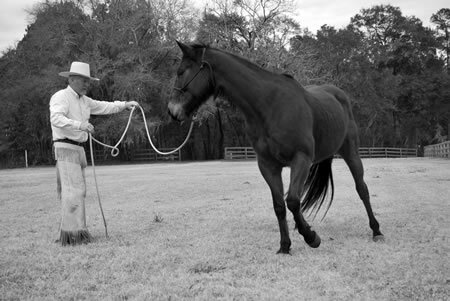 If your horse is prepared and feeling of you, he should shift his weight onto his outside hind or left hind, pick up his right front and set it in the direction you are now asking him to travel. 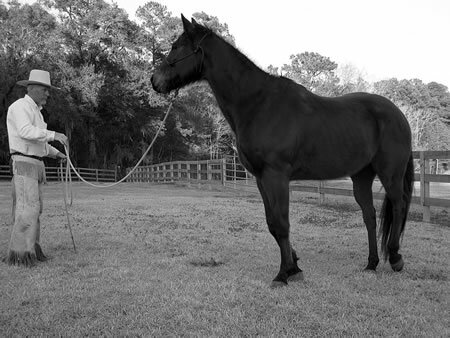 As your horse begins the new direction, again be aware of your horse’s shape through the body and the foot fall. Next time you are doing groundwork with your horse, take this opportunity to see if the “whole” horse is operating properly. 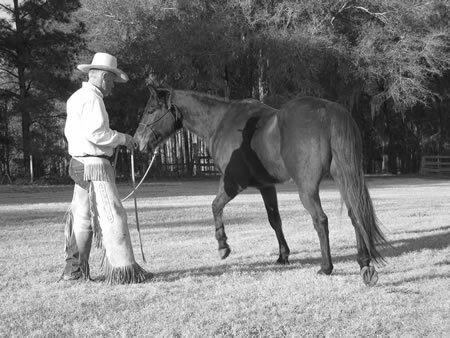 Changing DIrections: After our horse understands the individual pieces of this groundwork, we might ask our horse to roll the hindquarters and change directions with no hesitation throughout the transition. You can see how this might look in this set of pictures. 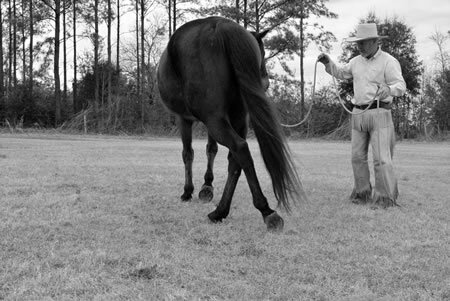 Rolling Over, Staying on Circle: When asking a horse to roll his hindquarters, the front feet should remain on or close to the line of the travel, when walking the circle. 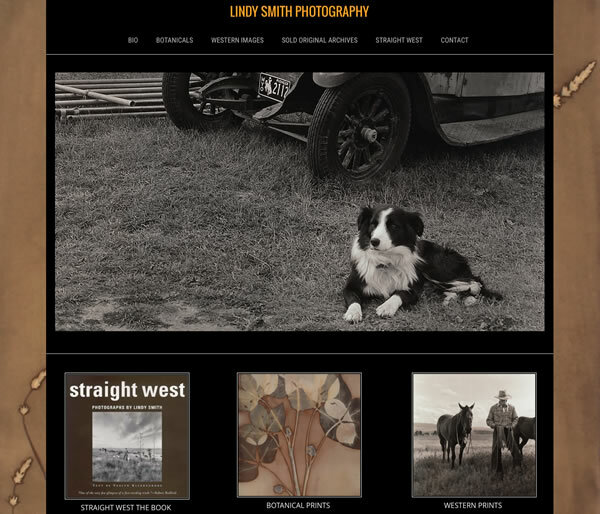 This sequence of pictures shows the horse moving his hindquarters away, and staying out on the circle, not dropping the shoulder and moving toward me. 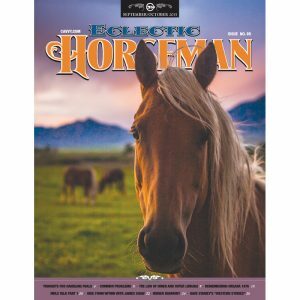 This article originally appeared in Eclectic Horseman No.